We had our first introduction to right hand preparation in Right Hand Arpeggios for the Classical Guitar. Now we can look at extending that idea and applying it to a range of scenarios. 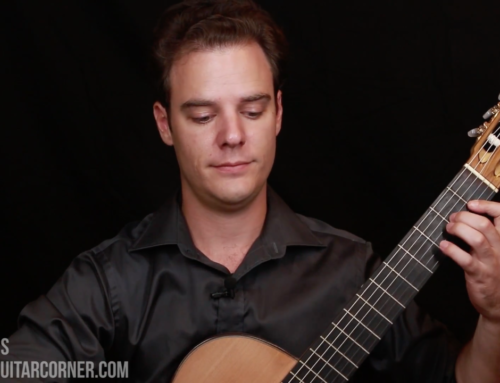 Right hand preparation offers stability, accuracy and certain articulation possibilities on the classical guitar. Some might argue that it is one of two main paths to go down in terms of right hand free stroke technique, but personally I think you can have the both of best worlds if you want. The concept of right hand preparation is quite simple: to prepare a finger to play a string by placing the finger on the string in readiness before the string is played. It results in more security and accuracy than without any preparation, however, by placing the finger on the string in readiness you will silence any note that may have been ringing on that string. This could be either desirable or undesirable, depending on the musical situation. Right hand preparation requires some finger independence, just as the left hand will need for much of its work. The goal is for the preparation to happen smoothly and in quick synchronization with the other fingers. While you may feel a little chunky and clumsy moving your fingers around now, with time these movements become smoother and more efficient giving you stability and control while reducing the amount of time actually spent prepared on the string. In fact, good right hand preparation might not look like preparation at all! The example of the arpeggio we just played is also a great way to train the right hand to stay close to the strings and in position. However, you will find that in a piece of music preparing your right hand fingers is not going to happen on every note and in fact you might just save it for some very particular moments when you want to control the tone of a particular note, or stabilize the hand. For instance if you had two very gentle notes, right at the beginning of a piece that you wanted to control, you could prepare your right hand fingers to play those two notes to execute them with accuracy. Similarly if there was a particular note out of a series of notes that you wanted to accentuate you might prepare that right hand finger well before it is needed.